This year's annual Halloween Haunt Odyssey took Hollywood Gothique to the Westside of Los Angeles and farther south to Torrance. Although we cheat a bit and label mid-October visits to yard haunts as part of the "Halloween Haunt Odyssey," in truth the annual trek takes place on October 31, when we hit as many yard haunts as possible, prioritizing those that are open on few if any nights except Halloween. As usual, we will split this tour into multiple posts, so that we can give each haunt its due; also, we are switching the order around, so that we can begin by highlighting one haunt that you can still see, if you hurry. Levitated by an unseen hand, a slab moves above a grave. This was actually our final destination on Halloween Night, because visiting any attraction afterward would be an anticlimax, like watching a supporting act after the headliner. We have praised this superbly spooky home haunt for many years; more than any other Halloween haunt in Los Angeles, the House of Restless Spirits feels like a genuine haunted house. To paraphrase a comment Philip Strick made in his book Science Fiction Movies, regarding the orbiting space station in Stanley Kubrick's 2001: A Space Odyssey, once you have seen the House of Restless Spirits, you really don't need to see the real thing. There are no shock scares; instead, you circumnavigate the house, peering through windows and into the back yard, where ethereal manifestations reveal themselves to those patient enough to wait and see. 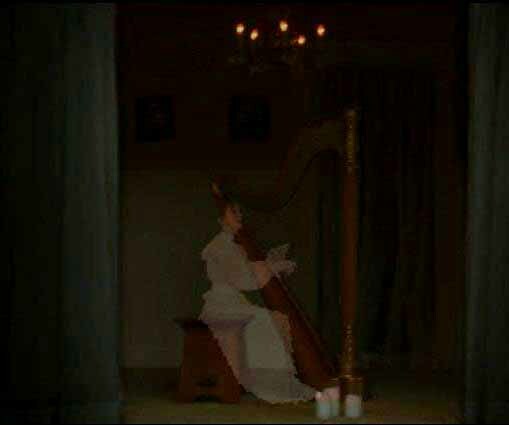 Seen through a glass door in back of the house, a ghostly harpist appears. The special effects are remarkable as always, and this year they are even better - new and improved. Some of the old effects (the sea captain's face appearing in a barrel of water on the porch, while a radio crackles a broadcast relating to the haunt's back story) have been recalibrated to synchronize together in a more satisfying way, which has the added benefit of making them easier to detect without hawk-like vigilance for every tiny detail. The House of Restless Spirits (like the old Hallowed Haunting Grounds) has always revealed its wonders best to those visitors with a slow pace and careful attention, but making the manifestations a little more apparent helps you relax and enjoy the haunting, without worrying that you're missing something great if you move along too quickly. Other familiar effects appear more vivid. The skeleton who rises from the ground to blow out a candle seems less ghostly, more solid. Faces on gravestones are more clearly etched, their eyes watching you as you pass. After the captain's face materializes in a mirror, the surface cracks with a sharp retort. Best of all, there are new supernatural manifestations on view. The old angry black cat, previously seen on a window sill, is gone, apparently to the world beyond. Now, you hear voices whispering in search of the feline, who materializes in ghostly form on the roof - a transparent outline with glowing eyes and a hint of fur, turning and moving as if alive. There is also a nice finishing touch as you emerge from behind the house and return toward the sidewalk: a sundial with a sailboat for a style, casts a quickly moving shadow on the surface, as if time were literally flying, while a disembodied voices intones the familiar saying, "Time and tide wait for no man." Definitely worth a revisit, even if you have been many times before. 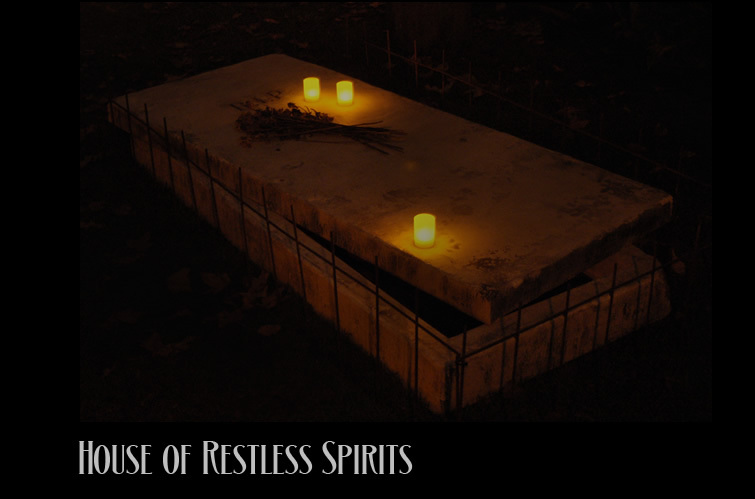 The House of Restless Spirits will be open Saturday, November 2 from 7pm to 11pm. The address is 1008 Euclid Street, Santa Monica, CA. Closing time is firm; the lines will be long, so arrive early. Click here to get more info at their website. After first hearing of this event a few years ago, Hollywood Gothique finally made the trip to see it in person. The Westchester Recreation Center has been presenting their annual Halloween walk-through for over two decades (probably a record for longevity among community centers), and the people working there now used to be customers. In short, this is the perfect epitome of a Community Haunt, put on by and for locals from the neighborhood. It's not professional in terms of production value, but that doesn't matter, because the people involved have gauged the event to suit their audience: it's scary enough to be fun for teens and young adults, but it's not going to traumatize the younger trick-or-treaters. 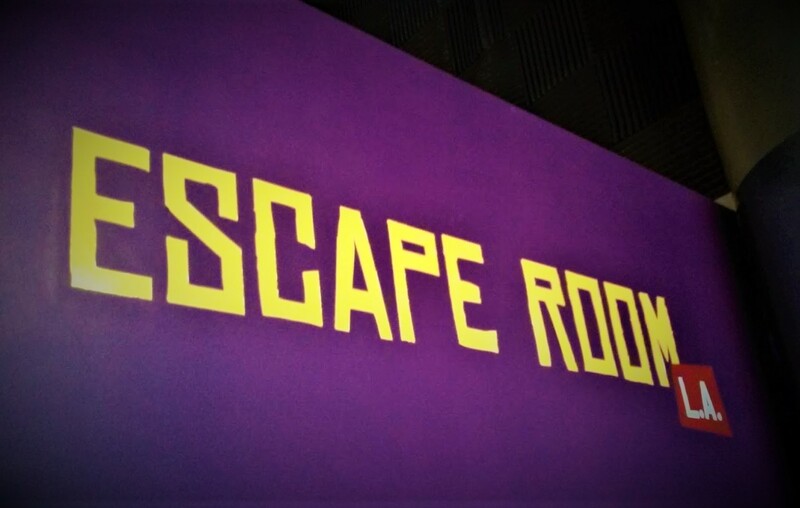 This Halloween, there were two mazes for kids eight and over; a Halloween Zone for younger kids had been in operation on Saturday, but on Halloween Night, only the scarier attraction was running. The sets are home made, set up inside a gym. Sometimes the location is fairly transparent; in other places, the illusion of being inside some strange environment is captured. So, the sets are not what you would see in not Halloween Horror Nights, but you get something you would never get at Universal Studios Hollywood: that extra special attention ghouls and ghosts can bestow when customers are not flowing through like a conga line. The monsters appear out of nowhere, administering jump scares, but even better, they block your way and pursue you, prolonging your close encounters with the undead for as long as possible. The enthusiasm of the performance counts for everything in a venue like this, and these monsters deliver the Halloween horror. 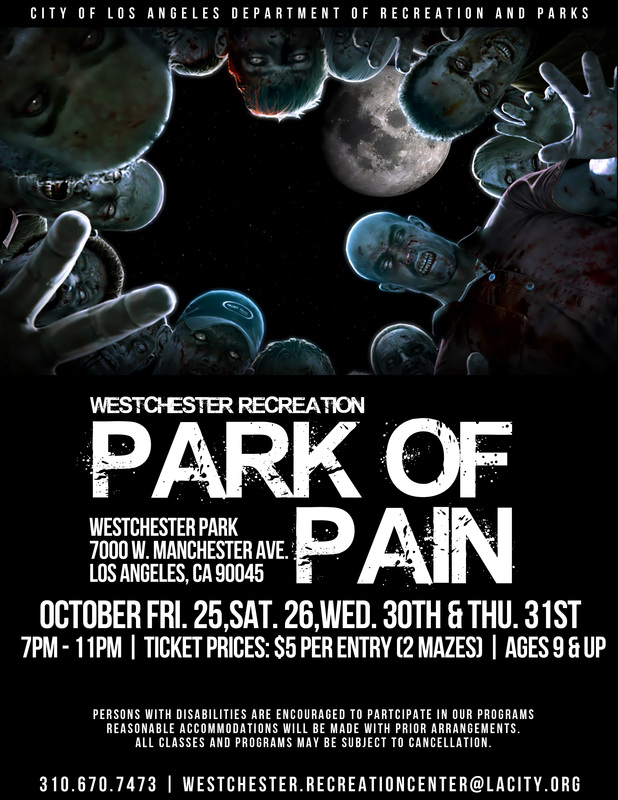 Westchester Recreation Center is located at 7000 West Manchester, Los Angeles, CA 90045. 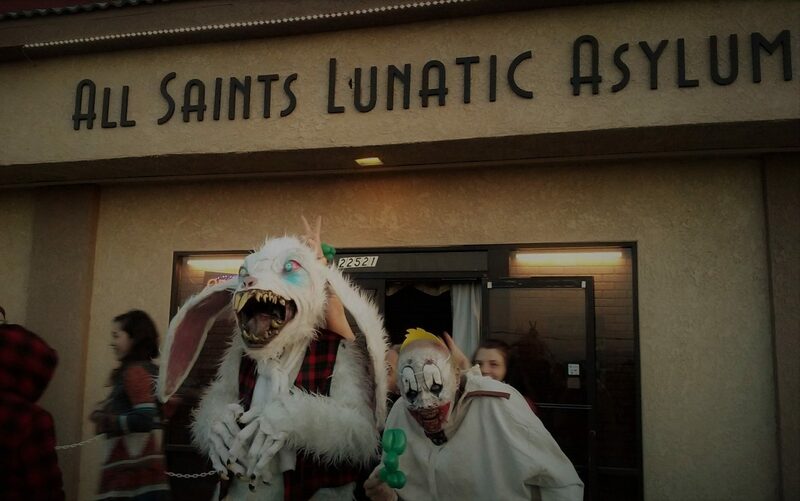 Their annual Halloween haunt runs on Halloween Night and usually a couple of evenings prior. Check their webpage next Halloween for their dates, hours, and ticket prices.